This interview was recorded in October 1985 and aired on Studs Terkel’s long-running radio show on WFMT-FM in Chicago. It’s one of several interviews the two men did over the years. Sagan had just released Contact, the book he wrote with wife Ann Druyan (and the major motion picture that followed it). We uncovered this interview in the WFMT Studs Terkel Radio Archive. Studs Terkel was a Pulitzer Prize-winning author who interviewed thousands of everyday Americans and international notables during a 45-year stint at WFMT-FM in Chicago. That’s inevitable that humans would project their hopes and fears upon the cosmos. The standard Hollywood attempts are to portray the extraterrestrials as red of claw and fang. Pointed heads and nasty dispositions. Steven Spielberg has made an important step forward. “E.T.” and “Close Encounters of the Third Kind” … to show the possibility of benign extraterrestrials, but even there, the extraterrestrials are only slight variants on human beings when the evolutionary record is clear that extraterrestrials would be very different from us. Also they’re not awfully smart, his extraterrestrials. If you look at timescales, you realize that our civilization is the most backward civilization in the galaxy that could communicate at all because we’ve just invented radio telescopes just a few decades ago. We had not the ghost of a chance of communicating with anybody else. So If we receive a message, it can’t be from anybody less capable than we, because anybody less capable can’t communicate at all. So it has to be somebody much in advance of us, and maybe as much in advance of us as we are in advance of the ants, say, or the worms. You, Carl Sagan, scientist, astronomer, enlighten me. You think that indeed there may be some sort of intelligence out there? May, surely. Surely may. There is, we now realize, an enormous number of planets. A range of planetary systems around the nearby stars. So there’s a lot of potential abodes for life. That’s one thing. Then there’s the question of organic matter. The carbon-rich complex molecules that are essential for the kind of life we know about, are fantastically abundant. They litter the universe. We see them in asteroids, in comets, in the moons in the outer solar system, and even in the cold dark spaces between the stars, so the stuff of life is everywhere. Then there’s time. There are billions of years for biological evolution on all those worlds, there are many worlds that are much older than ours. You put those together, lots of places, lots of organic matter, lots of time, and it seems very hard to believe that our paltry little planet is the only one that’s inhabited. You know, there’s a phrase you use about the earth people us, we, are so benighted. “The Earth is the ghetto of the universe.” We’re the ghetto of the universe. Well in an extremely backward and obscure part of the Milky Way galaxy. We’re thirty thousand light years from the center of the galaxy. We’re in the galactic boondocks. This whole galaxy is only one of probably hundreds of billions of other galaxies, a useful calibration of our place in the universe. There’s also religion and science. There is a tendency in both schools of thought to think that they have a corner on the truth. I mean, a way to look at it is the following; science and religion on some level are after the same thing. Take the question of our origins. Both science and religion attempt to approach this question. But the religions all contradict each other, so they can’t all be right. The Judeo-Christian Islamic religion holds that the world is about six thousand years old; you just count up the “begats” in the Old Testament. It’s very clear, six thousand years old. The Hindus have an infinitely old universe with an infinite number of creations and destructions of the whole universe. Now those two major religions can’t both be right. How do you tell which is right and which is wrong? The only way is to appeal to the natural world around us, and the natural world around us shows that the Earth, for example, is about four point six billion years old and nothing like six thousand years old. So a literal reading of the Bible simply is a mistake; I mean it’s just wrong; it’s just wrong. As a work of science, it is flawed, it’s the science of the Babylonians in the sixth century B.C. We’ve learned something since then. Well you quote Einstein. The cosmic religious feeling. He is religious in that sense, is the strongest noblest mode of a scientific research, so there’s a religion of sorts that Einstein believed in. Right, but it’s very different from most people’s view of religion. Einstein talked about God, but for Einstein God was little more than the sum total of the laws of the universe. There was no hint of intervention in daily life, of the efficacy of prayer, of life after death, or any of those accoutrements of the Judeo-Christian Islamic religion. Family Guy creator Seth MacFarlane is such a huge fan of Sagan that he put up the money to purchase over 800 boxes of papers and other material from Sagan’s wife, which he then donated to the Library of Congress so that they would be available to the public. Check out the Seth MacFarlane Collection of the Carl Sagan and Ann Druyan Archive at the Library of Congress. You can even watch home movies of Sagan as a boy. 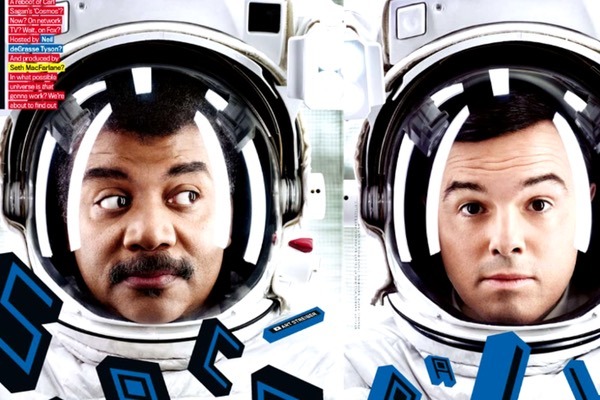 Hear McFarlane do a wicked Sagan-impersonation while talking with Neil DeGrasse Tyson. 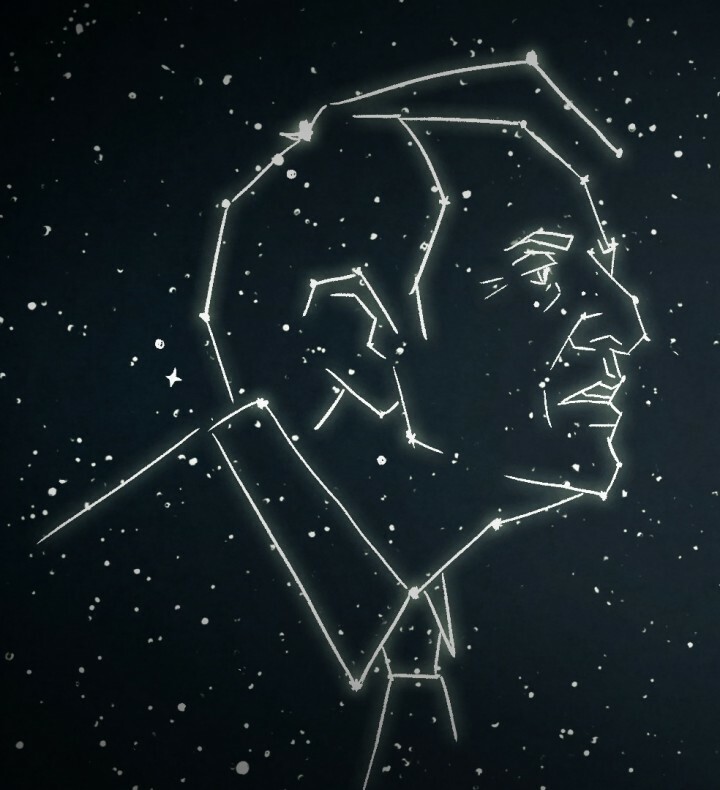 MacFarlane got us thinking about other notable names who love space, from Tom Hanks to David Bowie. Check it the group on the blog. Tyson met Sagan when he was still a high-schooler in the Bronx. The aspiring astronomer wrote Sagan about attending Cornell and wanted to meet with the acclaimed professor. “I really would like to be in Ithaca when you drop by,” Sagan replied to Tyson’s letter. Sagan was passionate about science education, often writing recommendations or doling out advice to students and young scientists. Tyson ended up attending Harvard, but resumed his correspondence with Sagan a decade later while a graduate student, this time seeking advice on publishing his first book. 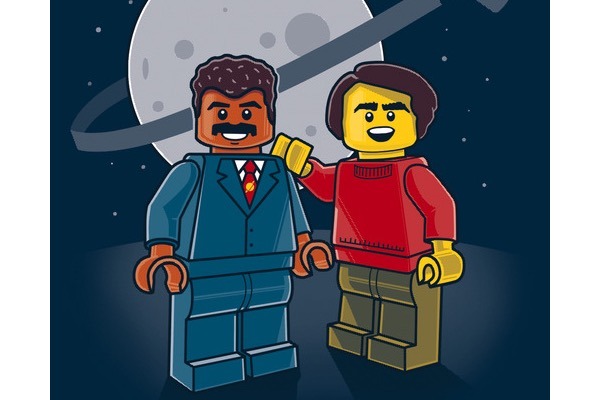 Tyson would go on to follow in Sagan’s footsteps, rebooting Sagan’s landmark PBS series, Cosmos, in 2014. Sagan with a model of the Viking lander in Death Valley, California in 1980.